You want to keep a diary. You want to write every day. With The Journal, you can! The Journal runs on any PC, laptop, notebook or tablet with Windows 10, Windows 8, Windows 7, or Windows Vista. Plus, with The Journal’s “Household License” you can use The Journal on any computer you own. I absolutely love The Journal. It is super easy to use; I’m more inclined to journal on my computer where it is secured, than I am by writing it out on paper or in a book. I am amazed at just how easy it is to use this product. I highly recommend The Journal for anyone who needs to journal as a form of therapy. I’ve been telling people about it at different meetings I’ve participated in. I loved that you gave me a discount based on my service to the country in the USN. Keep up the good work! Professionals! Use The Journal to track your daily progress on all your projects! Build a text database! Compile a knowledge base to make your job easier! Keep your professional secrets secret. Students! Take The Journal with you to class. Never misplace notes or struggle with deciphering your handwriting ever again. Writers! Whether you are a professional writer or an aspiring author, The Journal can help you organize your manuscripts and ideas. The Journal even provides writing exercises to help you hone your skills. Self Improvement! Journaling is a powerful tool of self analysis. With The Journal, you can quickly and easily record your thoughts and feelings throughout the day. Daily Devotionals! Record your spiritual insights and know that you can always find them again. Family Historians! 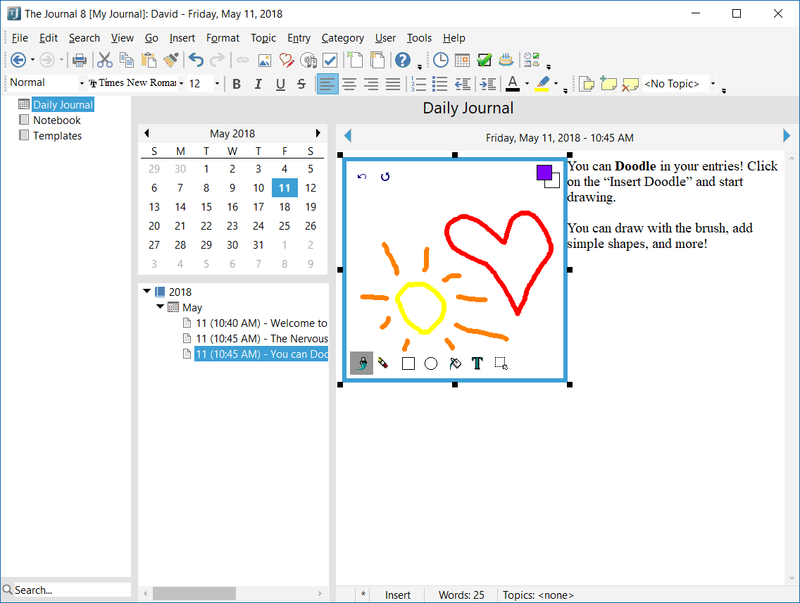 Combined with the Memorygrabber add-on, The Journal makes it easy to write your own memoirs. 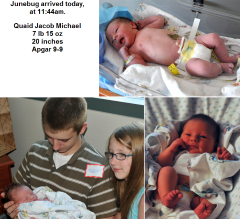 You can also help your parents, grandparents, or even great-grandparents record the exciting story of their life. Dream Journaling! Let The Journal help you remember and analyze your dreams. Thank you so much for The Journal. When I started working as a Senior Software QA Engineer for Comcast Interactive TV Groups I thought there was no way to learn it all or remember all the technical information found in cable TV systems. It was overwhelming. Keeping a journal and being able to categorize all my technical notes has made it easy for me and has helped me advance quickly in my field compared to my counterparts. The Journal is a fantastic tool for my brain and career. It’s not just for writers!!!! I love, love, love The Journal. It is very well designed for any user, from a novice to a veteran geek like me. The idea of providing the user with a fully functional product to test drive for a very generous amount of time is definitely a way to go. I did not even wait that long. After only a couple of days of using The Journal, I knew I would be buying the license. Thanks again, for making such a great, useful and user-friendly program! See what You can do with The Journal! 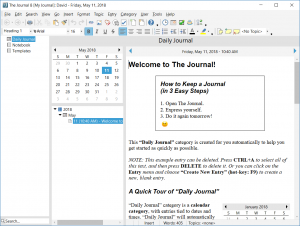 The Journal is more than just “diary software”! The Journal can do so much more than just help you keep a daily diary (and it can do that really well). The Journal is Incredibly Easy to Use! Make entries on any date, at any time! Search for anything, anywhere in your journal! Click here to earn more about The Journal’s convenience and ease of use. The Journal is Both Powerful and Flexible! Doodle in your entries, or even edit photographs! Be as organized as you want to be! Click here to learn more about The Journal’s powerful features. Be as secure as you want to be! Want more than the default level of security? The Journals’ Extended Security features are also available to lock your journal up as tight as possible. Click here to learn more about The Journal’s security. Your entries are automatically saved as you make them! Easily move The Journal to a new computer! Click here to learn more about The Journal’s reliability. The Journal is more than just a “note taker”! The Journal is a powerful journaling and writing tool that can help you take control of your life. Create a digital scrapbook of your life! Organize your notes about your family, about your work, about a hobby, about anything. Remember your appointments, events, tasks & special days! Find whatever you’re looking for with The Journal’s powerful searching. What a great program! I have been journaling on my computer for several years now, but have never been happy with the program I was using. Once I found yours I immediately moved all of my data over…and registered. Thanks! Keep a Journal Your Way! The Journal is highly flexible and can be personalized to suit your style. Whether for business or personal use, you can customize The Journal to be exactly right for you. Daily entries, weekly entries, or even hourly entries. All of those are possible. Make entries on future dates up to 9999 AD, or as far back in the past as 1 AD. You can even have entries that aren’t tied to any date at all. Organize your categories as an expandable tree, or in color-coded tabs. Use the included paper backgrounds for your entries, or import your own. Choose the visual theme you want from the large collection available. Make The Journal your journal. The Journal is just the greatest! It’s so well organized, easy to use, and full of incredibly useful features. I especially like it’s wonderful linking abilities. This program has actually helped me tremendously at work – where I now get the most use out of it. I am, by nature, VERY disorganized, and it gets me in trouble constantly at work. I have a job wherein I often work on several projects at the same time, jumping back & forth between them, and I don’t have the time or wherewithal to keep notes to help me keep track (i.e., where should I put the note- main folder, project folder, project sub-folder, on the server, which folder on the server?, etc.) Now it’s all in ONE PLACE, with links to pertinent files- it’s just WONDERFUL!! I HIGHLY recommend this program to anyone who needs to be able to easily keep track of all their computer work, as well as anything else they feel like typing text about. Well worth the price! Take The Journal with you! The Journal can be installed to any USB or external hard drive, allowing you to take The Journal with you anywhere! 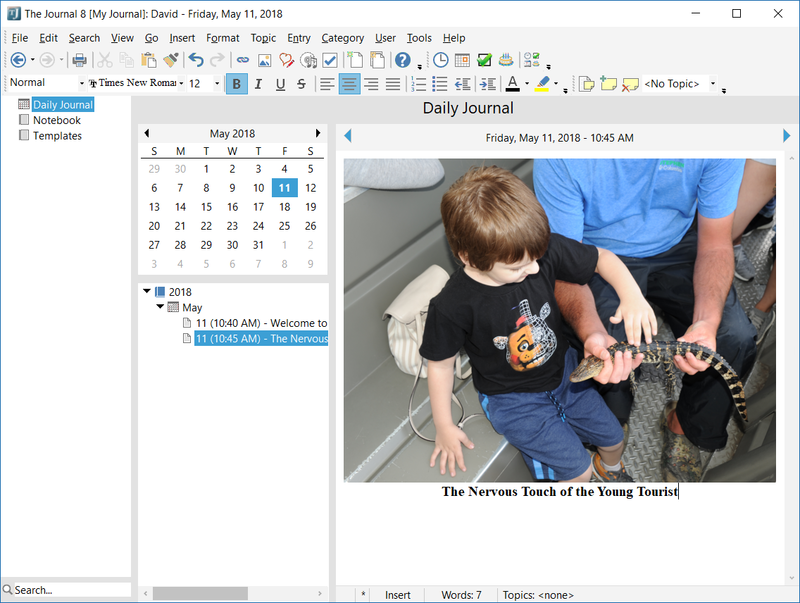 Just plug the USB drive into any Windows computer and you can run The Journal–with all your entries! No need for synchronizing or copying files. The Journal is always right there! 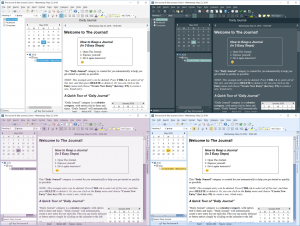 Click here to learn how to use The Journal on a USB drive! 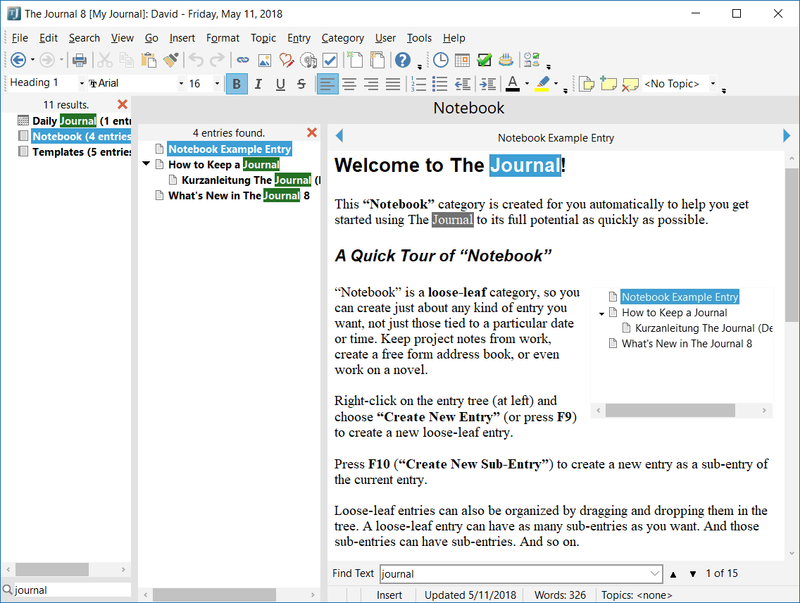 Use The Journal in the Cloud! Do you have a cloud drive (like DropBox or Skydrive) mapped to a folder on your hard drive? 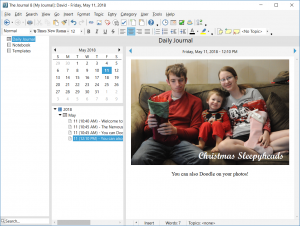 You can install The Journal (software plus all your data) into your cloud drive folder. 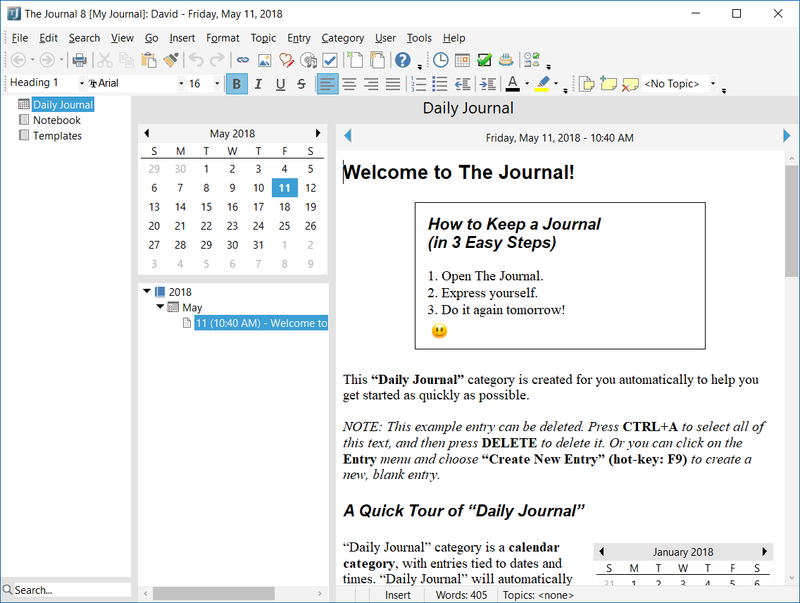 Then you can run The Journal and access your entries on any Windows computer where you use that cloud drive. 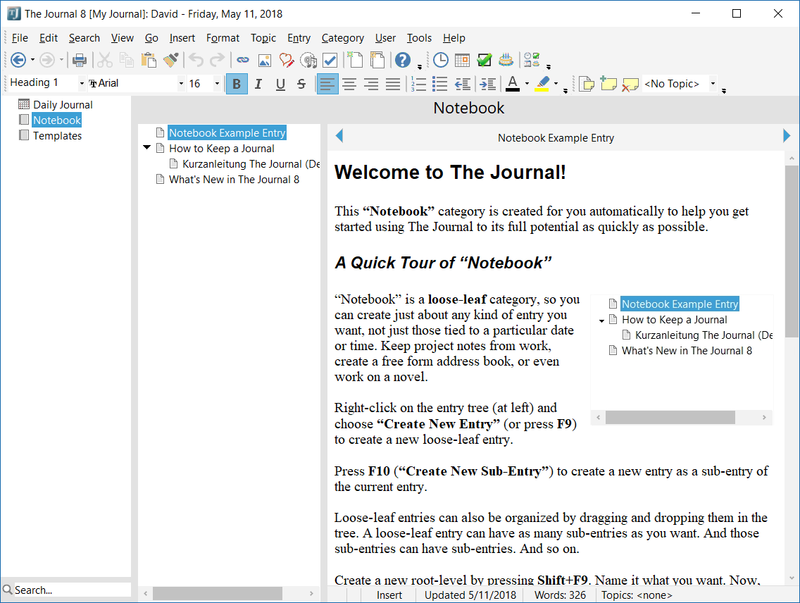 Click here to learn how to use The Journal in the cloud! 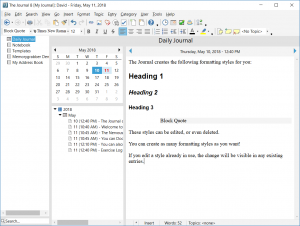 Try The Journal FREE for 45 days! That’s a month-and-a-half (just over 6 weeks) where you can access the full feature set of The Journal. 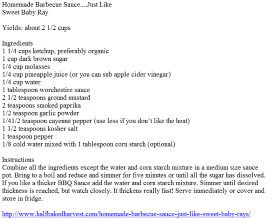 Experiment! Put The Journal through its paces. Find out if The Journal can really do what you need it to do with NO OBLIGATION. Create as many entries as you want, past, present, future! And don’t worry about having to re-enter your entries when you choose to buy The Journal. You don’t even have to reinstall. Just enter the Registration Keys you are sent when you purchase The Journal, and you’re set. I have used your journal for several years. I am addicted. I may never perfect the art of writing. But your Journal is great for learning. Thanks for listening. A passionate journalist. The Journal turned 20 this summer! For two decades The Journal has been helping people (including me) take notes at work, remember how they felt this time last year, write books, track goals, organize projects, store recipes, draft blog posts, rant in safety, keep secrets, record dreams, jot ideas, resolve resolutions, and more–sometimes, all at the same time! 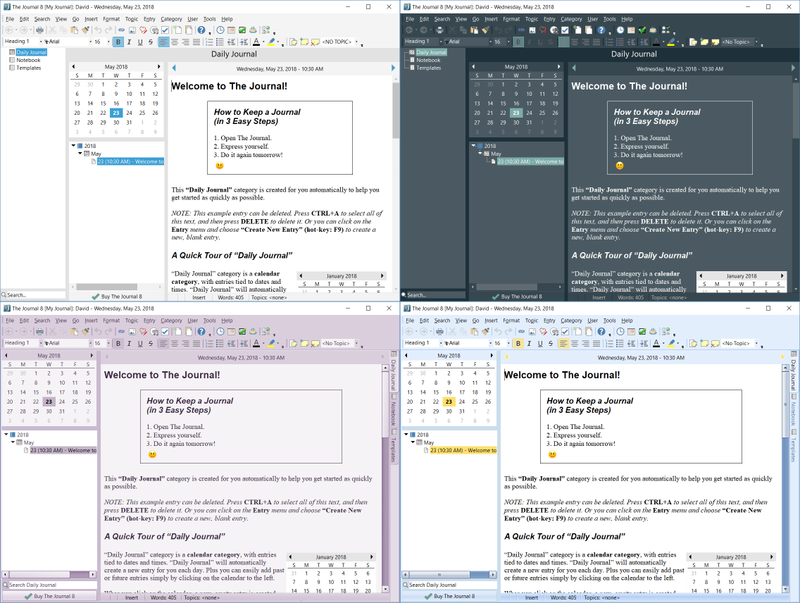 I just wanted to drop you a note to tell you I’ve now been using your journal software for 10 years! I’ve amassed over 5,500 entries and find it invaluable for both my home life and work too. Your software is by far the best, and so easy to use. I love the way The Journal is so functional, clean and reliable, plus coupled with the regular updates you roll out I know my entries are safe. I’ll continue to keep my journal for as long as I can still type, and your software will always be my choice because quite simply there is nothing better to be found, and I wouldn’t trust anything else with my entries. This quick letter was just to let you know how good your software is, and how essential it has become for my day to day life. I can’t imagine a day without typing something into my diary! Keep up the good work. 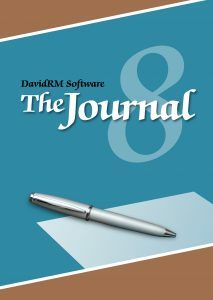 Ask questions, swap journaling techniques, and learn tips and tricks for using DavidRM Software's The Journal. Subscribing is free (and the emails are ad-free)! Just enter your email address and click "Go!" To unsubscribe, enter your email address in the form again, and choose "Unsubscribe" from the dropdown list. Are you a Student, Teacher, Military Veteran, Police Officer, Firefighter/EMT, Nurse, Senior Citizen, or just looking for a deal? If so, there’s a discount for you! Click Here to Choose from the Available Discounts! See The Journal in Action!